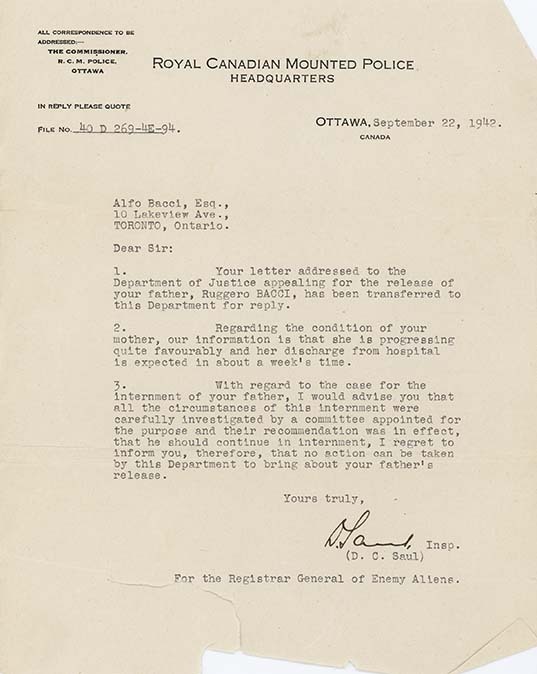 Letter from D.C. Saul (RCMP Inspector for Registrar General of Enemy Aliens), to Alfo Bacci, September 22, 1942. In this letter, the R.C.M.P. Inspector writes to the youngest son of internee Ruggero Bacci. Previously Bacci had asked to be released to see his wife, who needed emergency gallbladder surgery (LICEA2012.0002.0071). His request seems to have been denied. As indicated in this letter, the authorities investigated her condition and determined it to be "progressing quite favourably". The writer also tells the son that a thorough review was made of his father's case, resulting in a recommendation that his internment be continued.